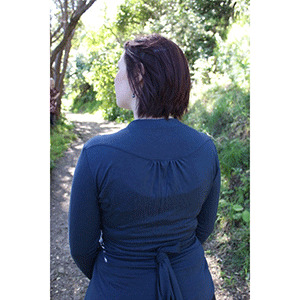 Gillian is a wrap-around dress, top or skirt, made up in knit fabric. 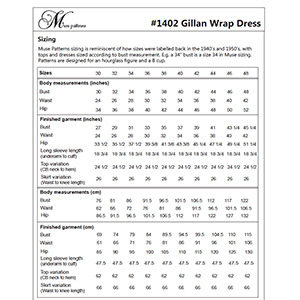 With its vee neckline and yoke details, Gillian has subtle design elements reminiscent of the 1970's (the decade best known for wrap dresses) and the 1940's, while remaining modern in cut and overall look. Make up the Gillian dress or top in a soft merino blend with long sleeves for a cozy winter garment, or in the shorter length with short sleeves in a lightweight cotton knit for summer. Use a heavy knit for the skirt for winter wear with boots and tights, or go for a lightweight knit for a garment you can throw on at the beach. Gillian is great for all seasons!